In WebWave website builder element Menu is responsible for adding navigation to your website, which allows users to easily move around subpages. In this article, you will learn how to build a website with effective navigation. 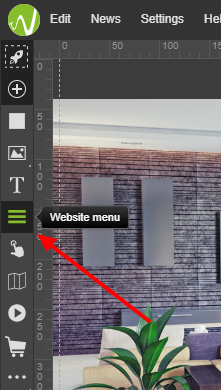 In website builder WebWave you can add menu from the toolbar on the left side of the builder. All you have to do is select adequate icon and drag and drop it on your website. Menu added to your website contains links to all your subpages. 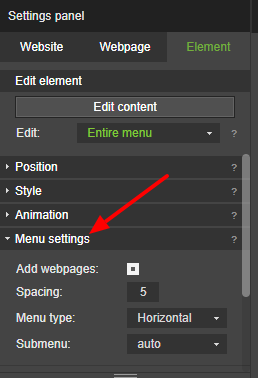 In order to edit a menu, right click on it and select "Edit content". To add a subpage to a menu, move it from right window, where you can see all subpages, to middle window, where you can see all subpages already included in the selected menu. To add a link to a menu select "Add link" from the bottom right corner of the menu edition window. In a field "name" enter a name of the new element in the menu. "Link to" allows to choose what kind of link do you want to create. None - create a menu element with no click action. This option is particularly useful while building a double-stack menu. When a user hovers on this element it unrolls showing the second part of the menu. Go to object on the page - create a menu element, which after clicking transfers user to the certain element on the chosen page. Select "go to object on page", choose subpage and element on it. If you don't know a name of the selected element, click on it and read its name from layers. It will be green. Webpage - create a menu element, which after clicking transfers user to the certain subpage on your website. 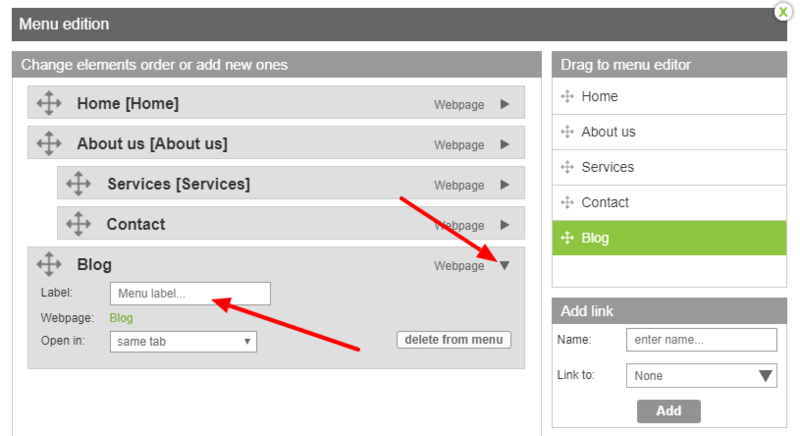 Go to newspage- create a menu element, which after clicking transfers user to certain newspage on your website. 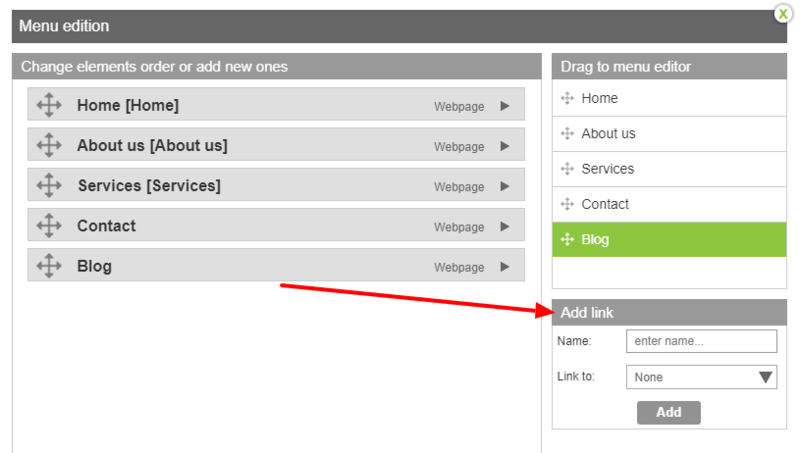 Website address - create a menu element, which after clicking transfers user to a website of your choice. Type URL address in "Website address" section and choose should it open in a new browser window. Telephone - runs default calling application like Skype on users computer or telephone dial on a mobile phone and automatically dials the number of your choice. E-mail - opens default mailbox application like Mailbox (Windows 10) on users computer or Gmail on users mobile phone and automatically puts e-mail address of your choice. In order to remove a subpage from the menu, drag it outside of the middle window. 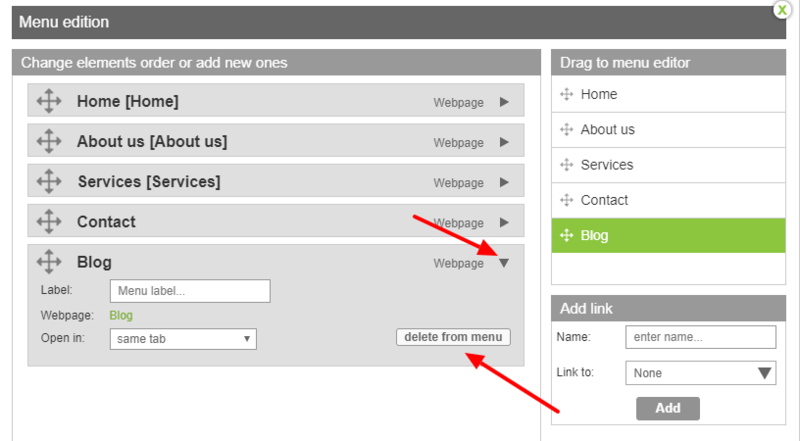 You can also unroll subpage details and select "delete from menu". To change subpages' order, just drag a subpage from a middle window and place it where you want it in your menu. In order to add elements to the second level of the menu, sort in on elements list and place "under" a first level button. 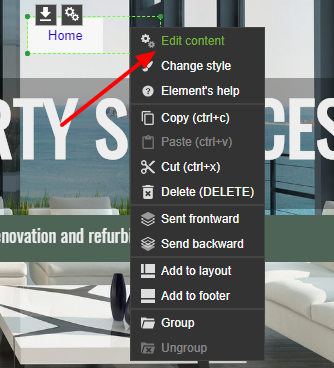 To change menu button label, enter menu editor and see subpage details by clicking an arrow on the right side. Select "Label:", type its name and press "Save". In subpage details you can also choose should the subpage open in a new browser window. In element edition menu select "Menu settings" to see additional features. Add webpages - each new subpage added to your website will be automatically be added to the menu. If you don't wany subpages to be automatically added to the menu, untick the box. Spacing - set spaces in pixels between menu buttons. Menu type horizontal/vertical/mobile - set menu type from horizontal, vertical and mobile. Read a detailed guide on how to create a mobile/hamburger menu. Submenu - choose whichdirection wil menu roll out (top/bottom/auto). To change menu type in WebWave website builder, select from element edition panel "Menu type" and choose from horizontal, vertical and mobile. The direction of menu rollout select in "Submenu". To change menu style all you need to do is a single click on it. In the side edition panel set attributes like in any other element. Change background color, visibility, borders etc. State normal - to change the style of a single menu button double click on it. The blue frame will appear and in the Settings panel, you will be able to edit a single button's style and its content. 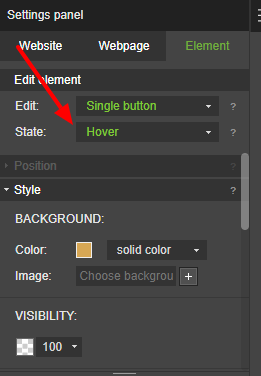 State hover - to change the style of a single menu button when a user hovers over it, select in the Settings panel "State: Hover" and adjust button's style and content. State active - state of linked subpage which is currently open. In order to edit this state select in the Settings panel "State: Active" and adjust style and content. 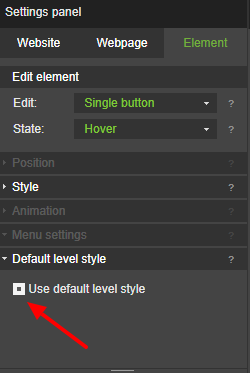 If you want one menu button to look different than others double click on it and in the Settings panel select "Default level style" and untick a "Use default level style" box. From now on, every change made to this button will not influence other buttons' style.